How can network contention and bandwidth competition between virtual servers be decreased? Network contention and bandwidth competition between virtual servers on the same virtual switch needs to be alleviated. The virtual server traffic needs to be isolated. Virtual switches can be used as isolation mechanisms to reduce network contention and bandwidth competition. Each virtual server is provided with access to a physical uplink and virtual switch that cannot be accessed by the other virtual server. Virtual Switches A and B are each provided with an individual physical uplink. The two physical uplinks are connected to Physical Switch A. 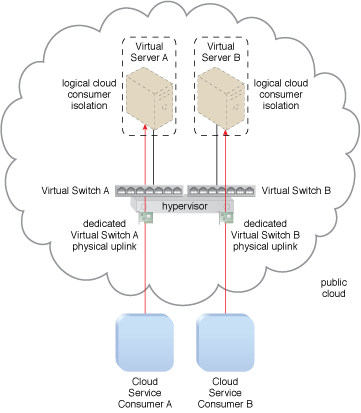 Virtual Servers A and B are connected to Virtual Switches A and B. The virtual servers are still connected to the virtual switches and cloud service consumers even if a physical switch or NIC experiences failure.